Contrary to conventional wisdom, at this time of year when the garden is in a headlong rush to produce fruits, and you can almost watch the plants as they extend their sinewy tendrils into the air like a group of octopi doing the wave, it’s sometimes hard to know what to do with it all. This is a peculiar problem for us since hitherto we’ve been limited to the cultivation of one basil plant, one of chives, a miserable-looking tarragon, and a solitary pepper plant in pots on our fire escape, so were limited to harvesting only as much as wouldn’t kill the plant at any one time. In this context, the occasion of the annual pepper (singular) ripening was celebrated with champagne and confetti. This year, while hardly drowning in produce, we’re finding that the gathering of some 20 or more cherry tomatoes several times a week, a glut of dark green basil and some of the most profoundly-flavored parsley we’ve ever tasted is presenting us with a conundrum: do we actually want to eat tomato and basil salad three or four times a week? Sure, we could be more imaginative, and if they were reading these lines, there would likely be a host of city-based food bloggers gnashing their teeth at our stupidity, but I am reminded of summers as a child when my grandfather’s garden would yield about nine tons of green beans during July and we’d be eating the damn things, steamed or blanched, morning, noon and night for a six weeks. I almost feel like being deliberately controversial here and suggesting that this frustration with having to eat seasonally since the dawn of time is why we shouldn’t be so damning of the range of options offered to year-round us by the modern agro-food system. However, knowing full-well that would generate negativity among readers, as well as being more or less against our own ethos of attempting to tread lightly carbon-wise, not to mention foolishly contradicting the implicit healthiness of this practice that kept my granddad enjoying one-too many lunchtime sherries well into his nineties, I’ll keep it to myself. Ever up for a challenge though, and, frankly, feeling rather bloody-minded, I tackled the issue of why eating seasonally can be boring head-on this weekend, and, making use of a particularly ripe pound of tomatoes, I made a kind of summery puttanesca, constituting a refreshing change from the raw fruit, but instead of stopping there and letting the seasonal flavors speak for themselves as we have been taught to do, I decided to pair the whole thing with some lascivious pork belly. 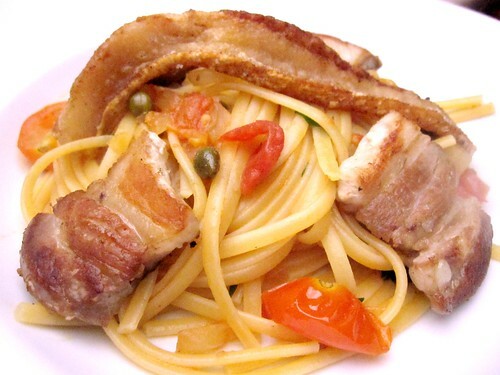 I say lascivious because, even considering puttanesca’s origins among the evening workers of Naples, there’s something that makes you feel inherently guilty about pairing a fresh, organic sauce with about the richest most unctuous part of the pig. Pan frying the slices of pork belly in its own fat, before using that fat as the base for my sauce, and deep frying the cracklins just for kicks, this was a dish to break any kind of kitchen monotony you’re experiencing, at virtually any time of year. We don’t eat a lot of pork belly and its measured use is kind of the key to remaining alive and vertical, but it does add a certain something that is literally unavailable from anything else, with the possible exception of guanciale. Indeed, had I not been frazzled by the heat and had pounds of fresh tomatoes weighing down on my brain, I would have used guanciale and turned this whole thing somewhere between puttanesca and al’amatriciana . However, I’m pretty happy that I didn’t, the briny, assertive character of the capers kept the belly’s richness somehow balanced, as did the acidity of the fresh tomatoes that might not have been present out of a can. In fact, I might consider eating seasonally more often if it meant I could dine in this kind of style. Handful fresh basil leaves (optional). In a large saute pan heated to medium-high, brown (and cook through) pork belly slices in its own fat. Then remove to a plate. In a separate heavy bottomed pan, heat 1/2 pint olive oil to around 350F/180C, and introduce fat strips. Fry until golden brown and crispy. Remove to a rack or paper towels, sprinkle with salt. Keep warm in oven until needed. Reduce heat in saute pan pork belly cooked in to medium, then in the rendered fat, sweat onions for 4-5 minutes until translucent. Add garlic, anchovies and hot pepper flakes. Cook for another 2-4 minutes, stirring occasionally. Increase heat to high for 1 minute, add wine and stir well, making sure to scrape caramelized porkiness off the bottom. When wine has reduced by half, add tomatoes. Stir well, bring to a boil, cover and reduce heat to medium. Cook for 8-10 minutes, or until all tomatoes have burst and become saucy. Add capers and almost all basil, reserving 3-4 leaves for garnish. Add linguine to boiling water, cook for 6-8 minutes or until al dente. Add one ladle of pasta water to sauce, before adding pasta to sauce also. Stir well to coat pasta with sauce. 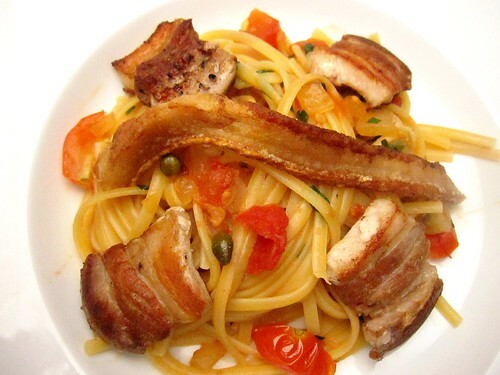 Plate pasta and dress with pork belly, cracklings and reserved basil. Enjoy with same white wine used to cook with or a hearty southern Italian red. See, I think it’s whatever feels right at the moment… and you can only eat so much salad!! Trick is, don’t pig out on it… the richness is just perfect… I can almost feel all that porky goodness weighing my fork down in a lovely way. Great dish any time of year! I wrote a post recently about how charcuterie (specifically in that case lamb bacon) is the key to happily eating one’s garden all season long. Glad to know you’re a convert as well. Can I interest you in some green beans? Yes, I find seasonal eating boring when I rely solely on my garden… I certainly have enough kale, tomatoes and cucumbers to sate me in veggies, but I need more variety than that! So I’ll freeze and can a bunch for the winter and add variety by going to the farmers’ market. I also only have a few flower pots of plants out on my tiny apartment deck. The thyme and rosemary already bit the dust because, despite my watering, they succumbed to the west Texas heat. My Thai basil is hanging on by a thread. I work at a research farm, so we are always getting tomatoes and other things in. I get tired of them, so I blanch them and freeze them. In January I will be glad to have garden-fresh tomatoes in my soup. Herb pestos also freeze really well. If you put them in ice cube trays for individually frozen serving, then you can put them in a freezer bag and have cubes of pesto anytime. There’s always a gem (or two or three) buried that makes me LOL. This time it was “the key to remaining alive and vertical”. BTW, anchovies is never optional! I always manage to get a good chuckle over here. Clearly, this is a sign you need to smear some of those tomatoes on crusty bread and top with a little jamon iberico. Seriously, though–this looks amazing. Filling, but amazing. Must say I prefer pork bellies to anchovies. This looks like a fun dish all around. I get what you mean about the seasonal eating thing. At least I can turn the tomatoes that crop up this time of year into marinara that I stick in the freezer. Alas I can’t grow them on my balcony. I never get a crop yield of more than 4 or 5 of them in a summer. I am growing tired of posting zucchini, tomato and corn recipes…….but as soon as my herbs are dead and the ground is frozen, I will surely miss the Jersey produce…..a bit boring, but I will take it anyday! Hope you guys are having a nice summer! Love the addition of the pork belly. How about making some pesto with all that basil? If you think summer wait produce is getting boring – wait until we’re well into the fall….how many ways can you serve a butternut squash?